Perfect for weddings, banquets, and much more! Elegance Design Plates - 10 Ct. Elegant Square Plates - 10 Ct.
7 In. White/Silver Elegance Plates - 10 Ct.
7 In. White/Gold Elegance Plates - 10 Ct.
6 In. 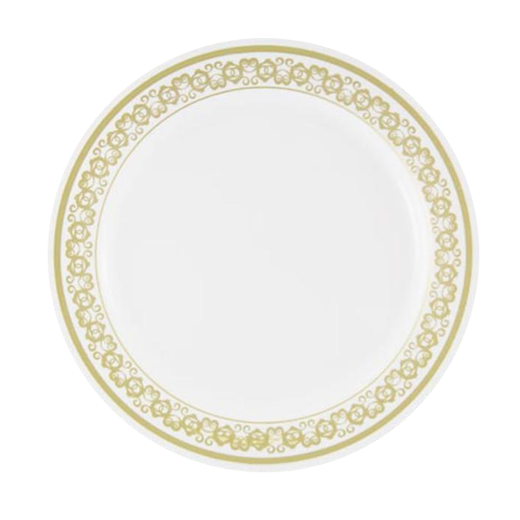 White/Gold Elegance Plates - 10 Ct.
7 In. Cream/Gold Elegance Plates - 10 Ct. Exquisite Classic Silver Plastic Forks - 20 Ct. Delight dinner guests at your next event with our Filigree Design plates. Made of premium plastic, each plate combines the convenience of a disposable with the stunning appearance of real dinnerware. Each plate features an elegant metallic filigree design that is certain to enhance any table setting. Perfect for weddings, banquets, and much more!